Autumn in the North Cemetery. Sixty miles west of Boston, Massachusetts there is the small New England town of Sturbridge. Located at the junction of I-90 (The Mass Pike), and I-84 it has become known as the "Crossroads of New England". The town was first settled over 300 years ago, and like other small New England towns it has grown just enough over the years to be in a difficult place today. How do we embrace the future without forgetting how we got to our present? How do we attract the right kind of growth, and maintain who we are? And, what about our culture out here in Central Massachusetts? These pages will cause one to think about how to protect what we have, our future direction, and how to move on in the very best way. It's obvious, the tree trimming sponsored by National Grid has been poor. The result of the poor pruning was witnessed by us all in October. Since then I have wondered whether this was due to the actual contracted tree service just going through the motions, or National Grid setting the bar, and expectation, far too low. The email I received from Sturbridge Tree Warden, Tom Chamberland puts the acorn right in National Grids lap. The Board of Selectmen need to play a bit of hardball with National Grid. Testifying to the incompetence of National Grid during the storm was great, now they need to set standards for Sturbridge, and insist that they be followed to avoid a repeat of the October power outage. When a warning of a hurricane comes from a meteorologist on TV we listen, and act accordingly; when a warning about ineffective tree trimming comes from our Tree Warden we would need to be as attentive. If we don't heed the warning, we'll be cursing National Grid in the dark again. 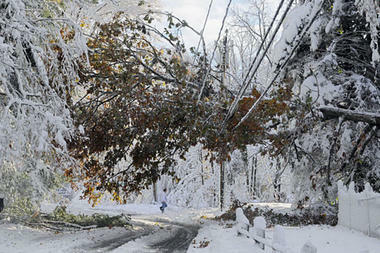 Snow damage to National Grid lines in Glastonbury Connecticut. the early, heavy snow in October 2011. Tree to trim [too] and has provided to the Town. It is these very branches that I feel caused the majority of the outages. Click here to view the National Grid drawings, and procedure, for trimming trees in different areas. In 2009, we spent some money on the trees around our property and along our driveway, having them pruned of dead limbs, inspected for bugs, etc. We don't have a garage and our cars are outside so we worry about damage to our cars. When this storm hit us, we experienced some downed limbs here and there but we didn't realize how hard the area was hit until we inspected our street (we're set back from the road and can't see other homes) and saw all the damage. We strongly feel that trimming our trees the year before strengthened them and they held up much better in the storm. Also, there were no deadwood or limbs to worry about. Homeowners can help themselves by spending a little bit of money on pruning the trees that are closest to their dwellings and along their driveways. We are certain that the few hundred bucks we spent went a very long way for us. Anonymous comments not accepted, and will be rejected. Please use your full name. Choose "Name / URL" and enter your name, and your name ONLY. Leave "URL" blank. Several Town of Sturbridge maps are now available on line to view. Click on the link below to view each map. Blog founded November 25, 2007. © 2007 - 2014. Watermark theme. Powered by Blogger.